Under the criminal justice system, a crime is regarded as an offence against the state and not the victim.The state steps into the shoes of the victim and prosecutes the offender. In the end, the state focuses on punishing the offender to either pay a fine to the state or commit the offender to a prison term. There is very little or no attention to the needs of the victim, hence leaving the victim unsatisfied, impoverished and bitter. In view of this challenge, there are other alternative methods of settling criminal disputes outside the traditional criminal justice system. 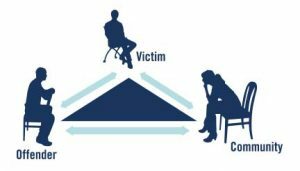 One of such methods is the victim-offender mediation. Victim offender mediation aims at restoring damaged or broken relationships between an offender and a victim by providing both parties an opportunity to meet face to face to address their differences through mediation. This is also called transformative justice or restorative justice. It enables parties to settle their disputes without going through the rigorous court trial process. The legal basis for the use of victim-offender mediation method of settling criminal disputes stems from Section 73 of the Courts Act 459 which provides that the criminal jurisdiction may promote reconciliation of offences that are not a felony or aggravated in degree. Section 64(1) of Alternative Dispute Resolution Act, 2010 (Act 798) states that the court may at any time refer a matter to mediation for a settlement of all or part of a matter which has been brought before it. It can be gleaned from these provisions that the absolute discretion lies with the court and not the parties. The parties may only urge on the court to settle their differences through reconciliation. It is also important to note that the court would not permit offences in the categories of felonies or aggravated offences to be settled using victim-offender mediation. The jurisprudence behind victim-offender mediation stems from the belief that it accords with the concept of individualism that pervades in modern society. The key concern is that the criminal justice system should be centred on the victim rather than the State since the offender may end up living in the same community as the victim; and also the the need to consider the feeling of the victim with the intention of restoring and transforming both parties to continuously live social peace and harmony. The mediation process proceeds on the assumptions that the feelings or the pain of the victim as well as the harm caused has been recognized, that the crime violated the basic rights of the individual, a breach of social values and the laws of the state. The proponents of victim-offender mediation in the settlement of criminal cases hold the view that the current criminal justice system is unable to satisfy the financial and emotional needs of an accused person. Also, not all offences must be disposed of or go through the conventional stressful, expensive, and time-consuming trial method. Sometimes imprisonment or fines may not be the appropriate punishment for offenders and may only end up increasing congestion in the prisons. As part of the process, the parties must have equal access to the selection of judges, venue and other procedural rules. During the mediation, the parties are allowed to narrate in full their side of the story and state the effect of their actions on the other party. The parties are then asked how they intend to treat the other party in the future. Dialogue is encouraged between the parties with a focus on the future. The sanctions meted out ,in the end, is mostly compensatory, to restore the victim. Apologies and atonement are considered. Victim-offender mediation offers many advantages to the parties, their immediate community and state. It offers an avenue to deal with less serious criminal matters. It gives the parties some level of privacy and attends fully to the victim’s needs. It helps decongest prisons, it prevents retaliation by reintegrating offenders into the community. Offenders assume active responsibility for their actions. Since the criminal and civil aspect of a case can proceed contemporaneously (Anarfi v Arthur) , can’t the victim just institute a civil action for damages to satisfy his financial needs?